5 cents a can or bottle. Not bad if you can get your hands on 2,000 bottles and cans each day. Recycling for your conscious is a great feeling and contribution to the earth. Getting a monetary return on it makes it even greater. It’s certain that there would be a much larger percent of US citizens who regularly recycle if they knew how to make a lot of cash from it. Unfortunately, turning in scrap metal or selling old books gets looked at as only turning out less than 10 dollars a trip. If you asked someone how much they think they could sell their clothes for at Plato’s Closet, they may say “5 bucks, maybe a bit more”. A matter of fact, your time and fuel is not worth it. However, there are two tricks to making BIG money by recycling. Before you learn them, let’s look at what you can recycle and get money for. According to the most word of mouth advice on what to recycle and make money on, in addition to the number of websites that will send you cash to turn items in, here is the top 10.5 items that you can get paid to recycle. 2. Old computers can get resold for their screens, motherboards and other parts at an average of $100 dollars. 3. Clothes are notorious for being an easy trade for cash with all of the thrift and discount stores. If you have a few popular brands of clothing and sell them during season, you can make a nice $5 – $35 dollars apiece. 4. Despite the move to IPod’s and IPad’s, you can still make money by selling your old CDs. The typical price is $2 – $4 dollars per CD. 5. Glass bottles can be turned in to your local recycling center for five to ten cents a bottle which would be an average of $5 an hour to find and pick up bottles. 6. Jewelry is now getting bought more from pawn shops and private owners than big brand jewelers, which is to say that you can make a lot of money by selling it online. You can also make a few dollars by selling it to a jeweler so that they can melt down the metals and reuse them. 7. $2 dollars a tire seems like a fair trade-off for the amount of old tires that you can find and get from local gas stations or off the side of the street. You can recycle old tires at retreading or rubber companies. 8. Toner cartridges are tricky because you don’t typically get money for turning empty ones in, but you get money off if you purchase replacements. You can typically save a couple dollars on a new cartridge by selling an old empty one. 9. Books are the easiest to recycle to other owners and receive a fair price. The price, of course, depends solely on what book it is. 10. Selling different types of scrap metal is easy at the scrap yard. You can expect to sell any metals such as aluminum, iron, stainless steel, copper, brass and others at a rate of 2 cents to 50 cents a pound which can be significant if you find an old dryer on bulk garbage pick-up days in town. 10.5 Everything else can be recycled or rather, reused by others. It’s websites like eBay and Craigslist, or even more simply and less digital, yard-sales, that prove time and time again that one man’s trash is another man’s cash. It is slightly contradictory that when you want to buy items in bulk, you regularly pay less, but when you sell in bulk, the seller makes more. It works in a similar way with recycling. You already know that the money to be made for scraps and miscellaneous items is pretty low. However, when you stockpile and gather a bulk of tires, a plethora of cans and bottles or a large number of toner cartridges, you are looking at just as large of a check with your name on it. Looking at the small picture does not work when you want to make money recycling. When you donate one bottle, or one tire, you are not going to make a substantial income. What that means is that you need to set yourself up to make a large amount of cash by setting up a large box for one, a few, or all the items listed above and tell yourself that you will not turn any of the items in until the end of the year. Getting a check for $1,300 is always preferred over $25 dollars a week or $3 dollars a day. Visualize that the box of all the items your saving to recycle will also be able to be filled with the cash you will get for all the items. Consider it a paid vacation for a little bit of effort each week to collect recyclables. If I were telling you these two secrets in the order of which will make you the most money, this secret would be number one. 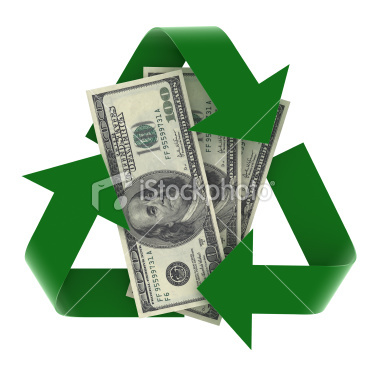 Without a doubt, the way to earn the most money by recycling is to get creative and innovative. There are thousands of people who have started a business solely on selling products that they have created from miscellaneous materials. Hand crafted recycled jewelry is one of the biggest interests from consumers, but it does not beat selling your personal creations locally. There are quick ways to do this as well, all you need to do is Google the item you want to reuse and see what people have made or stop by on Pintrest and search for “Upcycled Items”. The biggest difference between secret one and two is that you have to “work” for secret one. Time is needed to devote to searching, picking up and transporting materials to get money for them. As for secret two, you can do it right from home and use whatever resources are currently available to you. You can make it a family activity, call your friends for help, or make it into an environmentally friendly hobby. All in all, the amount of money you make is completely dependent on how much time you would like to devote to recycling. If you still want to make a positive environmental impact, it would be a great idea to connect with a friend or family member and split the time devoted to collecting recyclables for a common goal. After all, you know the money you will make from recycling will be on the shallow side, but if you make the goal of purchasing something significant with the money you make from recycling, you will have all the motivation you need. Always keep the mindset that there is not an item that can’t be reused and even resold somehow, all you need is a little free time and a little creativity to make the earth happy, to make others feel they have received something truly unique and to make yourself excited with some extra cash in your pocket. I am really impressed on how you specify the basic recycling method to earn cash. Not only that they are achievable but they also emphasize the practical means of making use of our garbage today. I hope that those rascals who keep throwing their trash would soon realize the loss they have made. I used to sell my old scrappy things here nearby junk shop. Also, most of it are electronics that is need to disposed. That way I earn a few bucks when they are not able to reuse. I think metal is still the main area to look at anything metal over here in the uk now just gets snapped up straight away some of the car scrap yards have practically no cars in them as they were getting more for the metal than they could make on re selling the parts which is great for them but not for you if you were looking to buy a replacement part a d didn’t have the money to buy new. I agree that selling jewelry online can make you a lot of money. What you just need is a wide connection, strong online presence, and of course high quality gold and silver jewelry. People would do better selling their gently used clothes on eBay than to give them away for pennies at Platos Closet. That store over charges for used items that I could purchase brand new at discount stores such as Marshalls or Burlington Coat Factory. The part about jewelry is interesting. Makes me think I might have some money in my jewelry case. Ebay might be the place to start. Pawn shops scare me. I might get ripped off. If anyone is going down the route of selling their gold jewelry online (or at a walk-in location) they must, must, must do their research and find out who are and are not the reputable gold buyers. It just takes 30 minutes to check out gold buyer websites and to call each one of them – and the difference in the potential payout is huge. Always speak to the company you are going to send you jewelry to and make sire you are completely confident in the services they offer and the guarantees they advertise. I have a friend who used to collect copper wire. At first, I really don’t understand why. But, after seeing that he collected kilos of copper wire and asked me to go with him to nearest junk shop in our area. I found out that that copper wire he collected can be sell again. Though I’m not sure how much was the price per kilo.